Compared with traditional sand making machine, Aimix’s sand manufacturing process can save 50% energy. The sand manufacturing plant can crush rock, sand, gravel and other materials into various size in accord with the requirement of construction sand. Sand made by sand production line has uniform size and high compression strength, and this kind of sand is much more in line with the construction requirements than the sand processed by the ordinary hammer sand crusher machine. Firstly, the feeding system. The system send raw material to sand crusher and sand screening machine. According to crush and screen process, feeding equipment includes vibrating feeder and other types of feeding machines. Secondly, the crushing system. The system is the heart of the whole set of sand processing equipment. The work of sand crushing plant system is to crush different varieties of ore raw materials into the required size of the finished product. 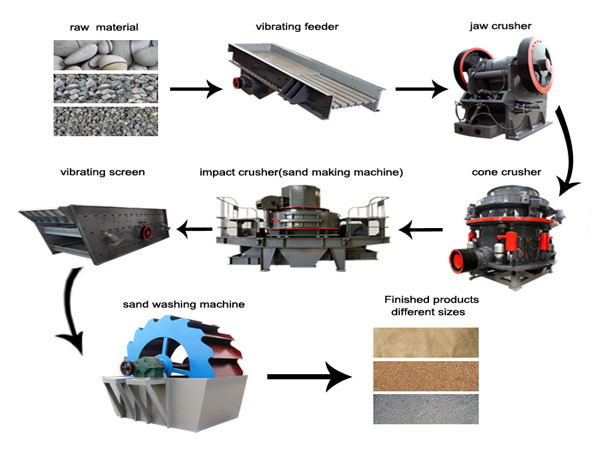 A complete stone production line includes many crushers. These crushing machines have different functions, and complete the crushing operation together. Thirdly, the screening and transporting system. The system screens the ore which are crushed by crushing machinery. 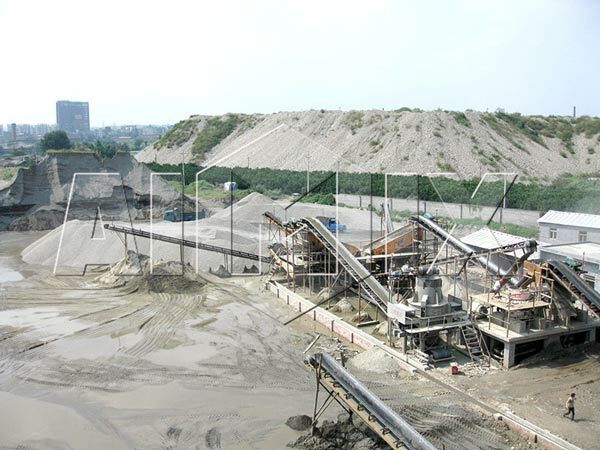 In the compound sand and stone production line, sand and stone need to be separated, and the separated material needs to be transported to the respective site. The sand screening equipment used in this process is generally a linear vibrating screen or other sand sieve machine. Safety Alternative double pump oil supply;machine stops automatically without oil flow or oil pressure.water cooling,motor warm start in winter. We all know that sand making plants are sand making equipments, then how to make sand by using sand manufacturing machines? 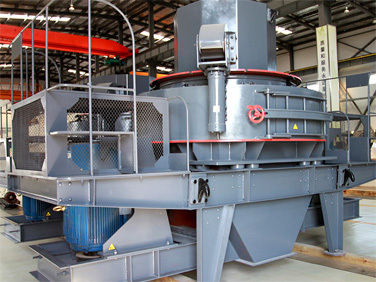 When sand making production line is working, large pieces of stone stored in the silo are transported by the vibrating feeder into the jaw crusher for crushing coarsely. The belt conveyor delivers the coarsely crushed materials into the cone crusher (or impact crusher) for crushing. And then the belt conveyor carries the crushed materials to the vibrating screen for screening. The finished sands(materials above the sieve) are transported by the belt conveyor to the sand washing machine for washing, and then they are sent to the finished product stack with belt conveyor. Large particles stone(materials under the sieve material) are delivered by the belt conveyor to the vertical mobile impact crusher (sand making machine) for crushing finely. Finely crushed stones will be sent by the belt conveyor again into the vibrating screen for screening. In this way, closed loops are formed. This is how do you make sand with a sand processing line. Firstly, our sand making machine for sale has more convenient maintenance method. Compared with other production line, its maintenance is simple. The wearing parts adopt the high-strength and wear-resistant material, which has small consumption and long service life. Aimix’s sand making machine price is reasonable and can bring customers considerable economic benefits. Secondly, it has fully automated operation process. It not only has high production efficiency, and high automation degree , but also has big crushing ratio and processing capacity. Thirdly, it has wider application range. It is successfully used to crush limestone, basalt stone, granite, pebble and other rocks. The finished product can fully meet the GB14685-2001 standard. And the sand making processing line provides highway, railway, water conservancy, concrete mixing plant and other industries high quality aggregates. Sand washing machine, also known as stone washing machine, is mainly used to remove sand products impurities (such as dust). Because sand washing machine for sale usually adopts water washing method, we call it sand washing machine. Among them, most machines are used to clean machine-made sand, so it is also known as stone washing machine. On the basis of different appearances and working principles, it can be divided into spiral sand washing machine, drum sand washing machine, water wheel sand washing machine, and vibration sand washing machine. 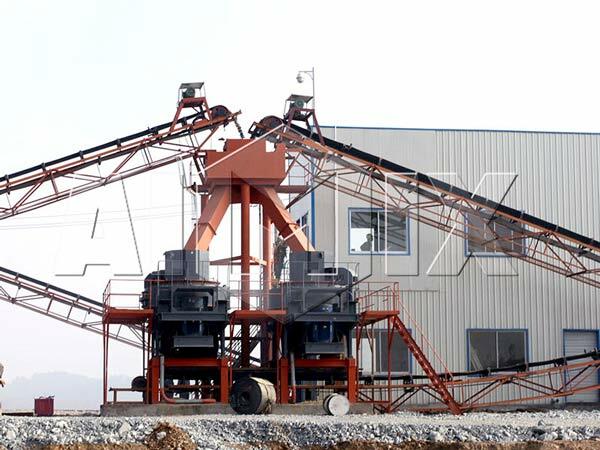 Aimix’s sand washing plant for sale has so many structure characteristics. Firstly, it has simple structure and stable operation. Secondly, it is suitable for all kinds of working environment. And the service life is relatively long. Thirdly, the washing materials have less consumption. Its washing efficiency is high and the sand washing machine can fully meet all the requirements of high-grade materials. However, there are not all the informations about sand washing plants. As one of sand washing plant manufacturers, Aimix’s sand washing machine price is very reasonable. Besides, we have more detailed information about the related products. You can contact us for sand sieving machine price, sand crusher machine price or other details. We suggest that you buy sand machine from professional sand plant manufacturers. Aimix Group, a professional sand plant supplier, can produce all kinds of sand maker machines and the related equipment, such as: sand washing plant, sand washing equipment, and sand screening plant. Aimix’s crush sand plant not only has high quality, but also has cheap price. Our equipments are directly sold by factory, so you don’t need to worry about the price! All kinds of sand making machine for sale and stone jaw crusher machines for sale all can be customized according to users actual needs. If you still have questions about sanding machine for sale, please send us an email. We will show you more detailed information, such as: sand making machine video, more information about sand screening machine for sale and so on. If you want to purchase, welcome to visit our factory at any time. We will always provide you high quality equipment and professional service!